Print/digital marketing campaign platform. Engine is Drip ECRM cloud service, WordPress for dashboard and landing pages, custom JS/PHP manages private URLs (pURLs) & QR codes; Calendly, Gyft, & Drip integrated via REST APIs. LIPM needed integrated print/digital marketing campaigns to offer customers and for internal use. A review of off-the-shelf marketing automation software confirmed most platforms better supported digital marketing rather than print. Platforms which did provide print-based marketing lacked many of the features found in newer, cloud based, digital marketing platforms. It was decided to build a custom platform called FOCUS. Drip was chosen for the core marketing automation engine. WordPress was selected for the user interface and landing pages. Other applications were integrated via custom PHP/JS code and REST APIs. PhpStorm, Chrome Developer Tools, custom code (PHP/JS/jQuery/HTML5, CSS3), WordPress, Beaver Builder Theme, Beaver Themer, Beaver Builder Pro, Ultimate Addon for Beaver Builder, Email Marketing by Drip, Gravity Forms, Gravity Forms Drip Add-On, Members, TablePress. 1. 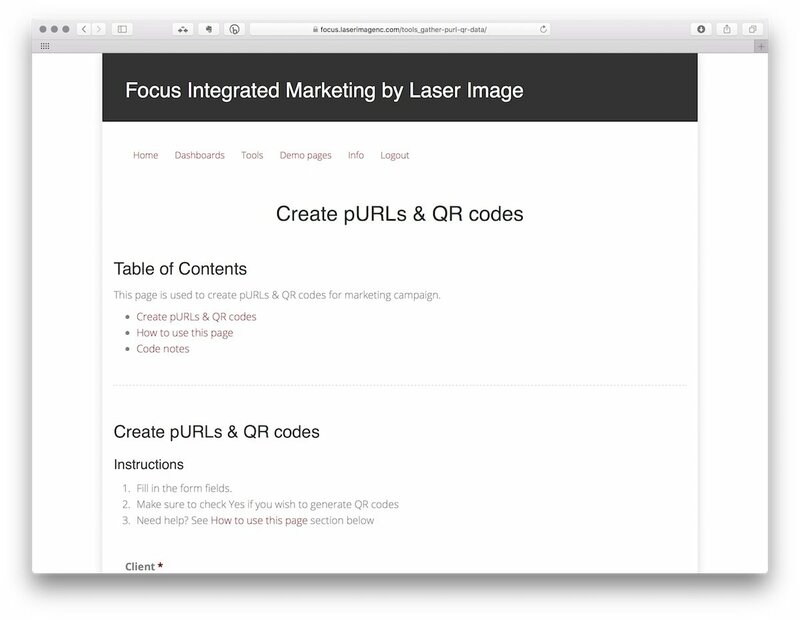 Custom code - Leveraging earlier code written to create private URLs (pURLs) for an LIPM customer, a FOCUS module was developed to create and manage both pURLs and QR codes. QR codes were generated using the PHP QR Code open source library. 2. 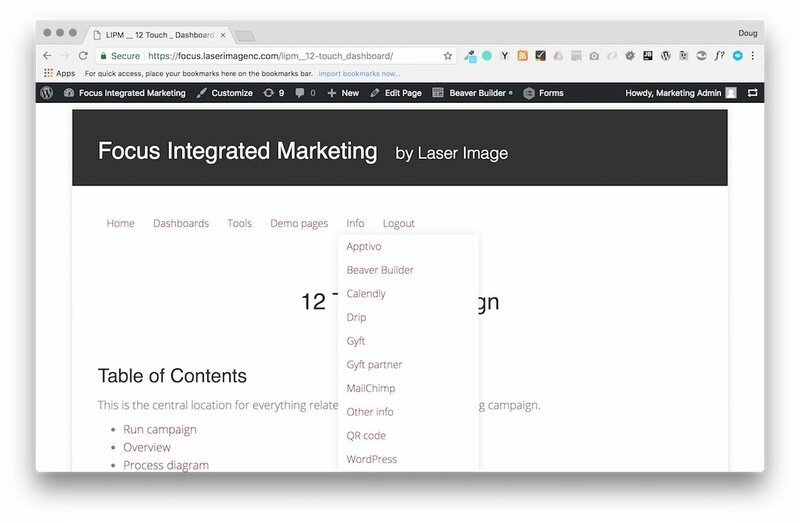 WordPress - Since LIPM's main website was built using WordPress, it made sense to also build FOCUS around WordPress. Using Beaver Builder Pro and custom PHP/JS code, a single, dynamic landing page was implemented (rather than generating a unique landing page per campaign prospect). The same toolset was also used to create the campaign admin user interface. 3. Drip - Drip served as the core automation engine. Due to Drip's extensive REST API interfaces (both PHP & JS), all campaign information & status updates were stored in Drip. Drip automated workflows were triggered by landing page visits and tasks completed. 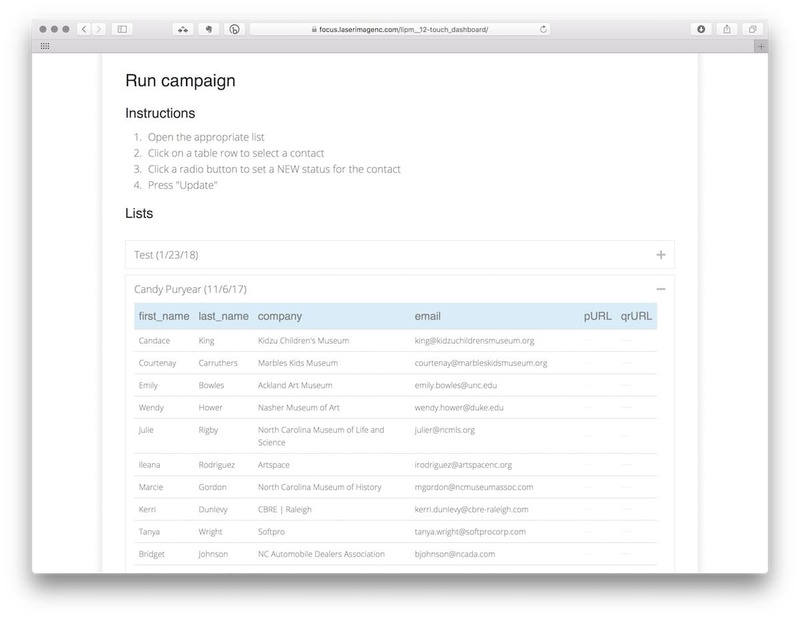 Drip's automated email responses were used to notify both campaign prospects and LIPM sales staff. 4. Calendly - Calendly was implemented on campaign landing pages. One of the 3 required tasks for a visitor to complete was to schedule a sales appointment with an LIPM sales person. 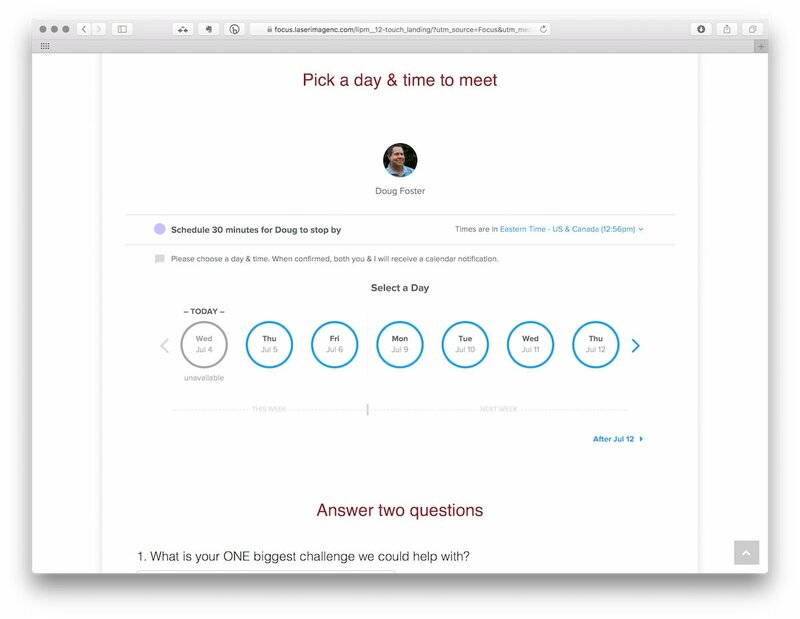 Using Calendly and FOCUS eliminated the need for the sales person to play "telephone tag" with prospects to schedule a meeting. A webhook was implemented so that when a Calendly appointment was scheduled, the prospect record in Drip was also updated. 5. 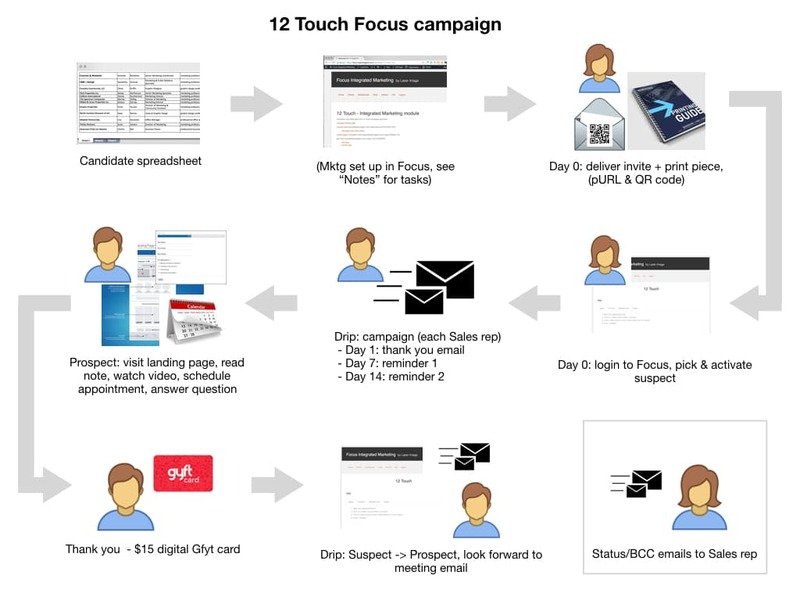 Gyft - Gyft was implemented at the end of the campaign landing page. 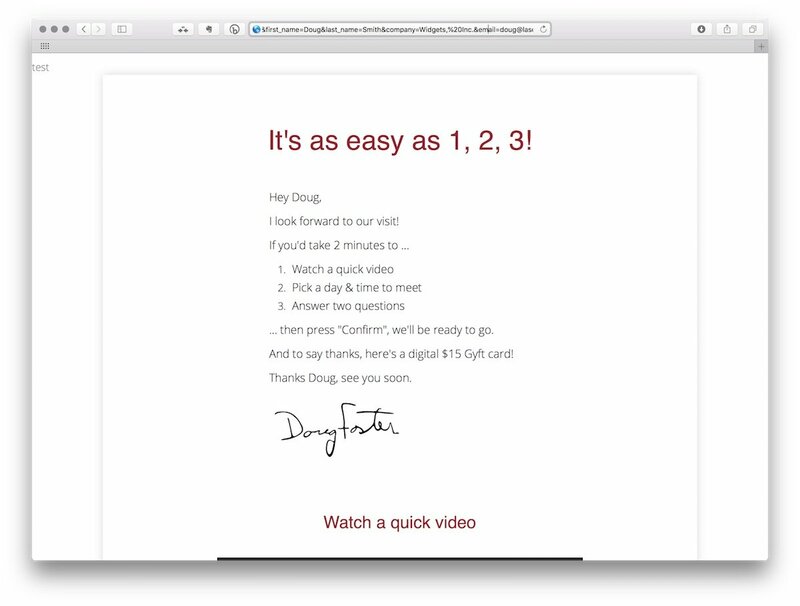 Once a prospect had finished the 3 required tasks - and the landing page confirmed that these were complete - the prospect was allowed to choose a $15 Gyft card (aka gift card) from one of 50+ possible providers. Once selected, the card was purchased via Gyft's REST API, the prospect notified on-page and with a separate email, and the prospect record in Drip updated via the REST API. Below are screen snapshots of some FOCUS pages, also a section of the documentation page.